Last night was not only the 43rd anniversary of the Stonewall Riot and beginning of the Gay Rights Movement, which is now even more appropriately called the "Equal Rights Movement", but it was also a CLAW Open Swim event which I was hosting. 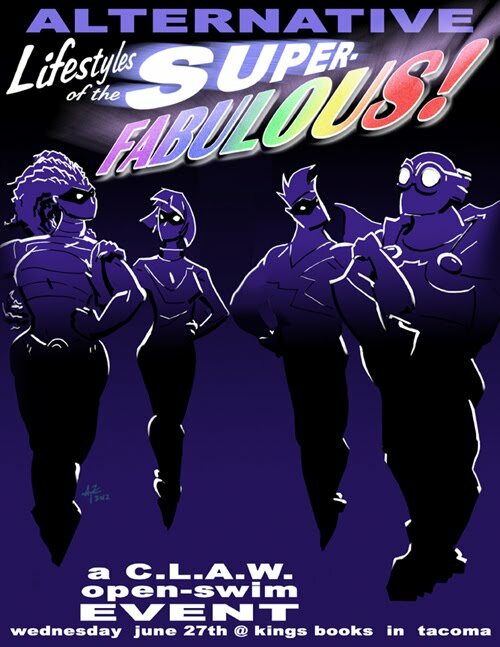 In remembrance of the fore-mentioned anniversary, we chose as out theme: "Alternative Lifestyles of the Super-Fabulous!" My fellow CLAW member Anique Zimmer did that schweet poster illustration and I added the text. I decided to NOT to be subtle. I was the host, so I wasn't really competing or anything...and I didn't have a clear, good idea going in. 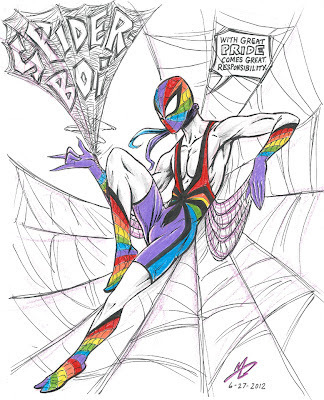 So I just took one of my fave superheroes and GAYve him a rainbow makeover! Before he was a crime-fighter, he tried wrestling...and wrestling singlets are hot, so I started there. I didn't think of the perfect tag-line for the drawing until I got home. "With great PRIDE comes great responsibility!" I HAD to add it in. I thought it was clever, even if I do say so myself.